Rural Neighborhoods’ start in disaster recovery and rebuilding was a baptism of fire. 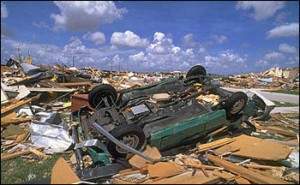 In the early morning darkness on August 24th, 1992, powerful 165 mile-per-hour winds ripped into the Everglades Labor Camp and much of southernmost Miami-Dade. Twisted aluminum siding, broken two-by-fours and soaked insulation is all that remained of the four hundred ramshackle trailers local fruit and vegetable pickers had called home for two decades. Evacuations had miraculously saved the lives of all who lived there. In the aftermath of Hurricane Andrew, our leaders fixed their eyes on the immense field of debris from dwellings we once managed. It was time to recover. In the 150 days that followed, construction equipment shaped infrastructure, an encampment of 934 new trailers were tied to the earth and nearly a thousand households took to new shelter in time to harvest local crops. It was a remarkable feat. It was also an unprecedented partnership: half this temporary new community belonged to us and the remainder belonged to local government. In a few short years, it would be joined as one even more remarkable village. It was time to rebuild. It started with a conversation – how do prospective residents envision their planned, new rural village. Forty million dollars in loans and grants were assembled. Tenant relocation began and then an unexpected not-in-my-backyard, knockdown, drag-out political battle. But hardened storm survivors boarded buses, built a common bond, took on their opponents and declared – rebuilding includes us! It did. In summer 1994 ground was broken and new dreams built. Homes, a community center and health clinic, childcare centers, neighborhood retail and parks took shape. Our 120-acre Everglades Village emerged as a national award-winning affordable housing community and – more importantly – a place to call home. One commentator remarked, “That hurricane turned out to be one of the best things ever to happen to Florida’s farmworkers.” Perhaps so, our endurance was tested and Rural Neighborhoods discovered its calling.